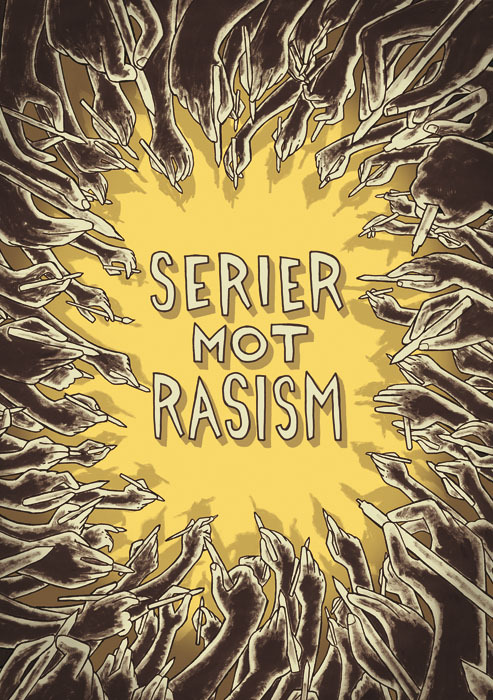 This comics anthology against racism will be released at SPX in Stockholm, May 5-8! My contribution is a 5-page Arg Kanin story. Dessa angelägna frågor ställs, tillsammans med många fl er, i den här antologin. Serier mot rasism är ett kollektivt yttrande från ett trettiotal svenska serietecknare mot främlingshatets allt mer påtagliga frammarsch i vårt samhälle. Med både humor och allvar angrips temat som angår oss alla – som vi var och en kan antingen höja rösten mot eller tyst låta gro vidare. Anniversary exhibition to celebrate the past 30 years of comics festivals in Kemi. Wormgod art as part of the Swedish exhibition at the festival. In Swedish Comic Sin 2: Wet Spot. 16 pages of erotica. In Serier Mot Rasism: Arg Kanin om Asylpolitik och rasistiska alibin. Same as in Asylkalendern 2011, but with two new pages added about incarceration and deportations. In Dystopia [upcoming issue]: My New Roommate. Script by me, art by Emre Özdamarlar. Satire about world politics and neighborhood policing. In Dystopia [upcoming issue]: konSEKVENS. By Wormgod. Comics version of the konSEKVENS exhibitions. Piracy is Liberation 009: Deicide. Next book in the series. More postapocalypse than cyberpunk this time around. Will contain the finalist story Spyware from the Morning International Comics Competition + a remake of an older story that was always intended to be a part of the Piracy is Liberation backstory. The title of the book is a clue. All of the above, if things go as planned, will be out in time for SPX in Stockholm (see link in previous post). And there’s a secret future project that I’ll talk about when I know more. Maybe two new projects.